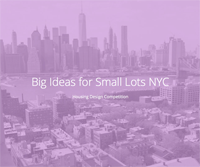 Big Ideas for Small Lots NYC is a two-stage design competition for small-scale, urban infill housing. The competition is organized by the New York City Department of Housing Preservation and Development (HPD) and the American Institute of Architects New York (AIANY), and seeks to address the challenges associated with the design and construction of affordable housing on underutilized City-owned land. In November 2017, Mayor Bill de Blasio announced the Housing New York 2.0 plan, which builds on the success of the original Housing New York plan and furthers the City’s bold commitment to increase the supply of affordable housing by building or preserving 300,000 affordable homes by 2026. In support of the plan, HPD has aggressively moved through its inventory of vacant and underutilized City-owned land to create more affordable housing. Much of the remaining inventory includes lots that are challenging to develop due to their small size. Big Ideas for Small Lots NYC is a design competition to find housing solutions for these lots, and to explore their potential to contribute to citywide affordable housing options. Nick Lembo, Chairman, Monadnock Construction, Inc.
HPD may choose to designate one or more Proposals formulated in Stage II to be constructed by the applicable Development Team(s) for affordable housing on City-owned land.